She lost her passport days before she was supposed to fly to Germany on an educational scholarship. Depressed but not dejected, Shifa Khan, a young entrepreneur from Srinagar tells Ruwa Shah how she fought odds and started a designer boutique in Kashmir. Standing behind a small counter at an exhibition held recently in Srinagar, Shifa Khan, 28, excitedly attends visitors. Wearing a black jeans and a black shirt, Shifa looks content while interacting with possible customers who stop by her stall where she is showcasing her latest collection of designer clothes. Two months back Shifa started Butterfly Boutique, a designer boutique for men and women in Jawahar Nagar area of Srinagar. Her face lights up when someone calls her young entrepreneur. She talks enthusiastically about new trends in fashion designing. “I love traditional Kashmiri attires, but my dream is to experiment with new designs,” she says excitedly. But Shifa’s journey to Butterfly Boutique is full of twists and turns. At one point of time in her career, Shifa, a graduate in Home Science, wanted to become an airhostess. But during her graduation she developed an interest in Clothing and Textile, which was part of her Home Science curriculum. “I used to cut newspaper into small pieces and then try to stitch those pieces together to learn designing,” said Shifa. 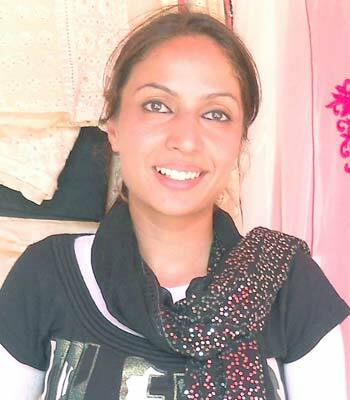 After graduation Shifa joined two different boutiques in Srinagar as intern to learn basics of cutting and stitching. In 2008, Shifa went to New Delhi to pursue MBA from Delhi University. She did her specialisation in Human Resource (HR). “I find HR best for a girl. It makes you learn how to run your home as well as how to cope up with the work,” feels Shifa. After completing her masters, Shifa came back to Kashmir and joined Motilal Oswal Securities Limited, Srinagar as its branch assistant manager briefly. Then she joined a local distributing agency as it operations manager and worked there for two years. “But somehow I was not satisfied with what I was doing. My heart still carved for fashion designing,” said Shifa. Finally she left her job in Kashmir and went to Delhi. “I got myself enrolled at National Institute of Fashion Technology (NIFT) for a diploma in fashion designing,” Shifa said. After learning the nuances of fashion designing, Shifa wanted to study marketing as well. She applied for many scholarships and fellowships in International Universities. In November 2012, she finally received a scholarship from Free University in Germany for Masters in International Marketing. “I was so happy. I completed all the formalities quickly. I had my passport and Visa ready. It was like a dream come true,” said Shifa. As it was not a full scholarship, Shifa took an educational loan from a bank and deposited the amount with Free University in Germany. “I did a lot of shopping. Everything was going smoothly. I was so excited,” said Shifa. But Shifa’s excitement was cut short when she lost her passport and visa just six days before her departure. “That was the turning point in my life. I had never thought this would happen to me. I was so depressed at that time,” she said. Shocked by the turn of events, Shifa was under depression and remained bed-ridden for about six months. All her ideas and plans were shattered. She also lost a part of her money she had deposited with the University in Germany. “Euro value was all time low when University refunded my deposit. I lost around Rs 3.5 lakh,” said Shifa. But before she went to Delhi to pursue fashion designing Shifa had applied for a loan in Kashmir from Women Development Centre (WDC). In April, 2013 Shifa got a call from WDC that her loan is sanctioned. Shifa saw a ray of hope finally. “This was again a turning point in my life. I had lost all hope when I was in depression. This call changed my life and I became an entrepreneur,” Shifa said with satisfaction. She used the loan amount (Rs 2 lakh) to fund her boutique. With the help of four employees whom she pays handsomely, Shifa dreams of reviving fashion in Kashmir. With just two months into business Shifa has earned a profit of Rs 30,000. “It is just a start. I want to become a successful entrepreneur,” says Shifa. Shifa believes that fashion is not defined by any particular class in the society. “Whatever suits you, you can call that Fashion,” she says. Shifa lives with her mother and siblings in Rajbagh. “After my father’s death (in 2006) my family stood by me during testing times,” said Shifa.